The Penrith Panthers proved too good for the PNG Hunters, posting a dominant 42-18 win in their Intrust Super Championship game at ANZ Stadium this afternoon. The win was set up by the Panthers in the first half, with the Hunters putting in a performance they would like to forget. The occasion seemed to get to the players who were nervous in defence early and were made to pay for it dearly. Big centre Tony Satini proved hard to handle for the Hunters, scoring four tries in the first half to firmly put his side in control. However, things had looked good for the Hunters in the opening stages of the match, as they forced an early error from the Panthers and followed that up soon after by posting first points thanks to a penalty goal from Ase Boas. However, the errors and defensive woes that plagued them against the Falcons in the Intrust Super Cup grand final came back to haunt them as they let in seven first half tries – including two in the final three minutes before the break – giving them an insurmountable 38-2 mountain to climb in the second half. Overall however, the Panthers proved too big and strong across the park, and winger Maiko Siva was the first to score in the second half in an ominous sign for the PNG side. However, they were soon able to settle into their work and their second half defence showed much more resilience against a side brimming with NRL experience. They forced a number of errors from the Panthers when they were on the attack and also held them up over the line, showing great effort against a much larger outfit. And while it all came too late, the Hunters had the best of the scoring of the second half, and were able to show off their skills to the delight of the crowd. They finally scored their first try in the 68th minute when Adex Wera was able to plant the ball down in the right corner. It was a hard-fought try which began when Wera made a bust and kicked the ball ahead, but Boas – who was in pursuit – was taken out without the ball. Panthers five-eighth Jarome Laui was sinbinned and the Hunters made sure they used their chance. Boas converted and they trailed 42-8. Wera was involved in the next try only moments later, again making a bust through the defence to set up the attacking play which eventually resulted in Bland Abavu going over for back-to-back tries to the Hunters. They had their third when skipper Boas went over with just under four minutes to go, with the video referee giving his effort the green light. He converted push the final score out to 42-18. They Hunters continued to press to try and score more points, and with 1.50 left on the clock, Nixon Putt way away down the left side, but a desperate chase from the Panthers forced the ball loose. While the loss was a disappointing way to end 2017 for the Hunters side, it was still a remarkable season from the club who earned not only the Intrust Super Cup premiership, but the minor premiers shield as well. 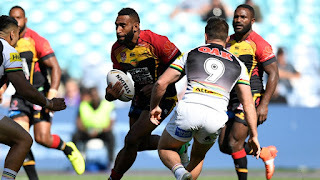 PENRITH PANTHERS 42 (Tony Satini 4, Darren Nicholls, Viliame Kikau, Christian Crichton, Maika Sivo tries; Darren Nicholls 5 goals) def PNG HUNTERS 18 (Adex Wera, Bland Abavu, Ase Boas tries; Ase Boas 3 goals) at ANZ Stadium, Sydney.